New Lebanon is a crossroads town, almost exactly midway between the great cities of New York and Boston. Two historic highways meet in New Lebanon: Route 22, which runs north-south from the Canadian border to the Bronx, and Route 20, an east-west road that you could drive, if you had the time, from Boston’s Kenmore Square to Newport, Oregon. New Lebanon is also a kind of border town: we’re right on the edge of the Berkshires, but we have a history of our own. For two hundred years, New Lebanon has been a place that people experience in many different ways. Some families have been here for generations: their grandparents or great-grandparents farmed or worked at the Tilden Pharmaceutical Company or ran small businesses. A few long-time residents can even trace their lineage back to the Mohicans, who of course lived here long before the town incorporated. From the beginning, visitors flocked to New Lebanon for day trips, weekend getaways, or extended vacations. Thus, this town at the crossroads has long been a place where people from all over the country and even the world meet and mix. 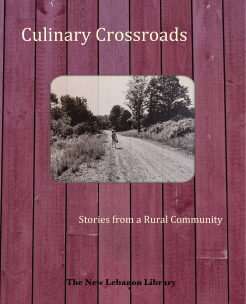 Culinary Crossroads, a compilation of recipes from Lebanon Valley’s kitchens, is a birthday celebration of that blending and mixing—and of the delightful, invigorating and surprising combinations that result—not only on our dinner plates but in our neighborly conversations and activities.